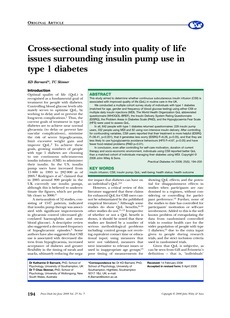 This study aimed to determine whether continuous subcutaneous insulin infusion (CSII) is associated with improved quality of life (QoL) in routine care in the UK. We conducted a multiple cohort survey study of individuals with type 1 diabetes (matched for age, gender and frequency of blood glucose testing) using either CSII or multiple daily insulin injections (MDI). The World Health Organization QoL abbreviated questionnaire (WHOQOL-BREF), the Insulin Delivery System Rating Questionnaire (IDSRQ), the Problem Areas in Diabetes Scale (PAID), and the Hypoglycaemia Fear Scale (HFS) were used to assess QoL. In all, 642 people with type 1 diabetes returned questionnaires: 228 insulin pump users, 332 people using MDI and 82 using non-intensive insulin delivery. After controlling for confounding variables, CSII users reported that their treatment is more helpful (IDSRQ F=38.41, p<0.001), that it generates less worry (IDSRQ F=6.26, p<0.05), and that they are less likely to use hypoglycaemia avoidance behaviours (HFS F=467, p<0.05) and have fewer food-related problems (PAID p<0.01). In conclusion, even after controlling for self-care motivation, duration of current therapy and socio-economic environment, individuals using CSII reported better QoL than a matched cohort of individuals managing their diabetes using MDI. Copyright © 2008 John Wiley & Sons.